Does Original Sin = Guilty Babies? Sometimes Catholics are accused of teaching “original guilt” rather than “original sin.” Are then human babies “guilty” of original sin? Let’s take a look at the Council of Trent. If any one denies, that, by the grace of our Lord Jesus Christ, which is conferred in baptism, the reatum of original sin is remitted; or even asserts that the whole of that which has the true and proper nature of sin is not taken away; but says that it is only rased, or not imputed; let him be anathema. Many English translations of this anathema inaccurately read “the guilt of original sin is remitted,” and this has led to much confusion. In Roman law “reatus” means liable to or indicted or a penal sentence. Alternatively, the Latin word “culpa” means an actual act of wrongdoing. Reatus refers state that accrues as a consequence of a culpa. In Justinian legal terminology (subsequently adopted by the Church), these two words have the following meanings. For example, if a man robbed a store, the “reatus culpa” would be his personally act of actually stealing the money – he is declared guilty. Now the “reatus poena” would be the penalty or sentence associated with the crime, for example, two years in prison. Now with Adam and Eve, they incurred the personal guilt (reatus culpa) of original sin and also the penalty (reatus poena). All their children (i.e. 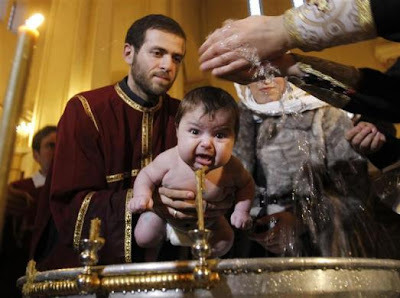 all human babies) receive only the penalty of sin (reatus poena), which is defined as being without grace, subject to suffering and death, etc. If you not convinced, simply note that human babies die, suffer, and become sick. As they attain the operation of reason and language, they universally commit sins. Lamentably, none of us are not living the life of paradise. Each baby is not guilty of eating the forbidden fruit, but each baby does receive the penalty of that sin. Now then, occasionally you will see some Catholic authors using “culpa” in reference to original sin. Here, however, they usually clarify it by adding “culpa contracta,” which is a special phrase and it does not mean personal guilt, but “contracted” guilt by association. So then, cupla contracta = reatus poena. Your head is probably spinning. I apologize. Adam and Eve received the personal guilt for the first sin. Babies are not strictly “culpable” for the first sin. However, babies do receive the penalty (reatus poena) of Adam’s sin. Babies do not come equipped with sanctifying grace, the preternatural gifts, they die, and they will sin when they are older. The Eastern Orthodox accusation that we Catholics believe in “original guilt” or “guilty babies” is false. Likewise, the Calvinist doctrine of “total depravity” (stating that humans fell from their “nature”) is also a grave error. Leave a comment if you still have a questions or something isn’t quite clear.